Cap d’Or is located on the eastern coast of the Peloponnese, in the bay of Kosta, across the island of Spetses at a distance of 180 km from Athens. A perfect location to use as a base for excursions to famous archaeolo- gical sites located in the area. Easy access is provided to Mycenae, the theatre of Epidaurus, the Sanctuary of Asklepios and ancient Tiryns, which have been designated by UNESCO as WORLD’S CULTURAL HERITAGE MONUMENTS. An ideal holiday destination which provides serenity in an idyllic natural environment. 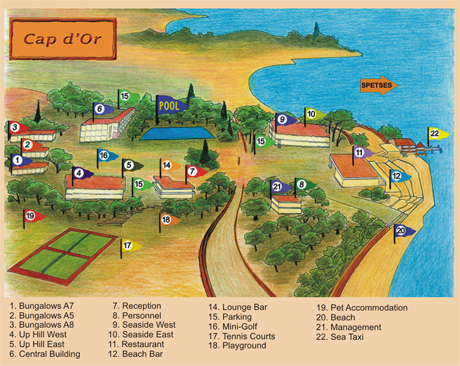 Nested in the bay of Kosta, Cap d’ Or is built in its own Pine forest which reaches down to the golden, sandy beach. Restaurant with panoramic view to the island of Spetses.